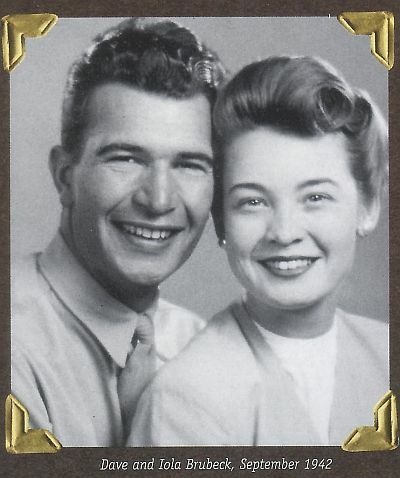 Dave Brubeck - Biography - Wife - Iola Brubeck. 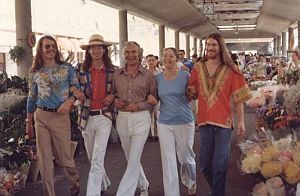 In the liner notes of the 1985 Concord album “For Iola”, Dave dedicated the entire recording to Iola “To the strongest inspiration of my life”. When one reviews Dave Brubeck's entire career, the paramount and vital role that Iola played in every aspect of it becomes abundantly clear. Despite the rocky beginning, Dave asked Iola out to a dance. They danced just once, sat and talked in Dave’s car for three hours and decided to become engaged that night. After her marriage to Dave, Iola completed her degree and continued her education while Dave was in the U.S. Army. 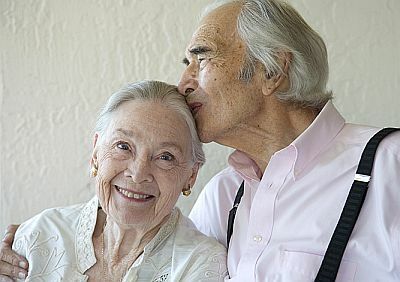 During World War II, while her Dave was overseas, Iola won a radio drama contest in San Francisco, and went to the NBC training school in Hollywood. She later free-lanced as a radio actress, appearing on several network shows. Upon Dave’s return after the war, they both enrolled at Mills College in Oakland, California. Dave studied composition with Darius Milhaud, and Iola studied philosophy and creative writing. With the birth of their first child, Darius, in 1947, Iola devoted her time to raising her family and assisting Dave in his career. In the late 1940’s, they taught a jazz appreciation course together at the University of California Extension at Berkeley and San Francisco. Iola did the lecturing while Dave was relegated to illustrating her points by playing the piano. Their teaching earned them the grand sum of $15 a week. While the Dave Brubeck Trio and Quartet were getting off the ground in the early 1950’s, Dave and Iola were extremely poor. She often took the children on the road so they could keep together as a family. “We learned to improvise in living; whatever place we could find to stay we stayed. We couldn’t afford the best so we learned how to use camping equipment inside a city hotel. We had sleeping bags and air mattresses. Chris was a baby and you’d pull out a drawer and put some padding in and blankets so that would be where he would sleep. Every hotel room Michael would go into, he’d look around and say, ‘Is this our new home?’ And we’d say ‘Yes, for a week’. And we always carried a footlocker and also their toys, books, games, everything was in that. I feel that I learned a lot of that from my own parents because my family had very little and our way of having a vacation was not to go to a resort, we always went camping. And we learned how to make do out in the wilderness someplace. And we loved it. So, fortunately, I think my background and Dave’s ranch background gave us sort of that, I don’t know, pioneer fortitude, I guess to okay, these are the circumstances, accept it and make the most of it. Make it work, it will work”. In the early 1950’s, after another lengthy tour of the USA’s jazz clubs with still very little emerging, Iola came up with an idea that proved to be a major turning point in Dave’s career and their live’s. Iola remembered the concerts the Octet had played at Mills College, the College of the Pacific and the University Of California and hit on the idea of writing to several hundred colleges that they could drive to by car, soliciting college dates. She wrote a 40-page book for college kids on how to put on a show with the Dave Brubeck Quartet. Just follow the checklist. This is what you do. The response was immediate and favourable, and enough to begin a new way of life, pioneering what became known as “The College Circuit”. Iola in an interview with Hendrick Smith for “Rediscovering Dave Brubeck” discussed the “College Circuit”. "That came about because of the success of the Octet at Mills College, and then shortly thereafter they played the University of California, Berkeley. They'd had such terrible response in the commercial world trying to play clubs. But this wonderful response from university students, especially where there were good music departments, that that seemed to be the way for them to work. And then I also figured that students don't have a lot of money, they can't pay the tariff to go into the clubs often if there's a big cover charge, many of them are underage as far as drinking is concerned. Bring the jazz to them where they can attend a concert as they would a classical concert. And this began to catch on, first just in California and then the ability to go up to southern Oregon and then to Washington and then to Salt Lake City and then to southern California and it began to build from there". 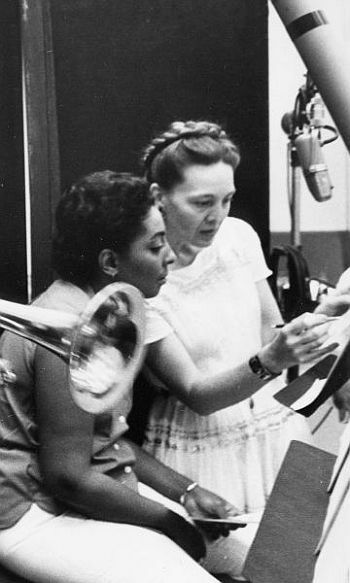 Iola further added that, “For jazz in general, this was an enormous new audience for jazz. Jazz bands would come in to play proms, dances and that sort of thing. But for a concert, just people to sit down and listen was very, very seldom done. And, of course, it built an audience later after Dave started recording with Columbia, in particular. They started out with “Jazz Goes to College” because that basic core of fans had begun to develop among the college audience”. It was a smash success for Dave Brubeck and for jazz. It exposed the music to a wider, mainstream audience, ensuring a fan base for years to come. 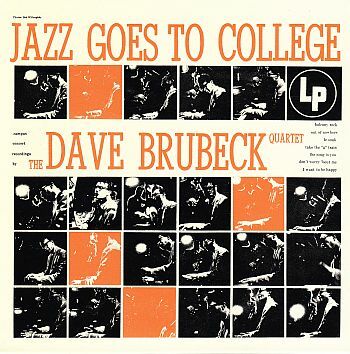 As well as “Jazz Goes To College” two other albums stand out from this period, "Jazz At Oberlin" from March 1953 and "Jazz at the College of The Pacific" from December 1953. When the State Department requested Dave and the Quartet to embark on a people-to-people cultural exchange world tour in 1958, Iola decided that she would uproot their children and assist the Quartet on this arduous journey. Dave and Iola underwent State Department briefings as to about the cultural nuances of the various countries they would visit including all those behind the Iron Curtain. The tour was a tremendous success, attracting huge audiences in every country. Throughout Dave’s career Iola wrote numerous lyrics to Dave’s compositions. Some of her words derived from their experiences during decades of travel. In 1962, Dave and Iola co-wrote a musical called The Real Ambassadors, which starred jazz legends Louis Armstrong and Carmen McRae. The musical a reaction to both racial segregation in the United States, and the quartet’s tour abroad. “Remember who you are, who you represent / Always be a credit to your government / No matter what you say or what you do/The eyes of the world are watching you”. These lines were similar to the instructions they received in the State Department briefings of 1958. The Real Ambassadors premiered at the Monterey Jazz Festival in 1962 to vast critical acclaim. Unfortunately, the show never reached Broadway,as among other reasons, it was considered potentially too controversial to be a success. Iola didn't confine her writing of lyrics to Dave's jazz compositions: she also wrote them for several oratorios and cantatas, including The Light in the Wilderness, The Gates of Justice, Truth is Fallen and La Fiesta de la Posada. Iola edited the text by poet Herbert Brokering for the cantata, Beloved Son and contributed text for the Roman Catholic mass To Hope! She wrote the libretto for Pange Lingua Variations, based on the Latin text of Thomas Aquinas. She also contributed the lyrics for Four New England Pieces and Quiet as the Moon. Throughout much of Dave’s career, she acted as secretary and personal manager. She arranged much of the logistics associated with being on the road for lengthy periods. At the height of Dave’s career, the quartet performed as many as 300 concerts annually. Iola's workload significantly increased, as she extended her assistance when Darius, Chris and Danny joined Dave in the Quartets “Two Generations of Brubeck” and “The New Brubeck Quartet”. Suddenly, her workload for the Brubeck household was quadrupled. Iola initiated, wrote much of and co-ordinated the wonderful Dave Brubeck Newsletter, which was distributed to fans for several decades. These were produced at least twice a year. These Newsletters, when read from start to finish, provide a wonderful biography of Dave’s career and music. When all the children were raised, Iola travelled with Dave to practically every concert and world tour. For fans who were lucky enough to meet her after concerts, she was always extremely gracious and kind. Iola passed away peacefully on 12th March 2014. Iola was, as Dave stated his “greatest inspiration”. She was also his wife, mother to his children, friend, confidant, manager, advisor and companion. She was his biggest fan.